Here at Storage.com, we want to help people get their homes organized and clean, whether through the use of self-storage or helpful online tips and hacks that you can try yourself. When people are hunting for the perfect home, there are plenty of things to consider—everything from the house’s location to the color of the walls is up for discussion! And while many people will turn up their noses at a cramped kitchen, a spacious bathroom doesn’t always top the list of concerns. The idea that a bathroom need only be functional is fine, but there are tons of ways to pretty-up a powder room that are useful, too! That’s why we’ve scoured the web to bring you some of the best DIY bathroom hacks! 1. DOUBLE DUTY SHOWER ROD. This quick tip is barely even a DIY—it’s that simple! Hanging a second curtain rod in your shower is an ingenious way to create extra space for bath products or kids’ tub toys. If your shower and bathtub are used by many family members or roommates, you can even designate a basket for each person, keeping everyone’s soaps and shampoos separate and off that mildew-prone tile. Cleaning a shower or tub can be a serious pain. But you can keep everything sparkling without tons of bleach or a Cinderella-style work ethic with this clever DIY shower scrubbing wand. Simply grab a dish scrubber that has a chamber for cleaning liquid, fill it with a heavy-duty homemade cleanser, and give your tiles a touch-up whenever you see a spot! Keeping this tool hanging from a shower head, organizer, or even the double rod we already mentioned is an easy way to keep your shower clean all the time instead of having to use elbow grease every few weeks—plus, it hardly takes up space, which means you can ditch those unsightly bleaches and sponges hanging out in your cabinets. 3. MAKE YOUR OWN MAKEUP BOARD. DIY makeup organizers are super popular around the web! Grab a metal sheet (size and shape of your choosing) and cover with a cute fabric. Then, add magnets to the back of your most-used (or strangest shaped) makeup, and voila! It’s a storage system that keeps cosmetics off your counter! Items like Q-tips, Kleenex, and bobby pins can be essential to a vanity or bathroom sink, but keeping that old resealable bag of cotton balls just sitting on your sink isn’t very appealing. Fortunately, classing up your counter space is incredibly easy. DIY vanity storage can be constructed from old candle jars, and you can even kick the whole project up a notch with a simple drawer knob and hot glue gun! Use emptied tea lights to hold rings or earrings or larger jars to display your frequently-used lip colors. 5. DIY EXPOSED LINEN CLOSET. Extra storage for towels and linens, particularly in apartments, can be hard to come by. But that doesn’t mean that you should resign yourself to the dorm room life of one towel per person! Whether you just have an additional set of towels for guests or 11 Monica Gellar-type towel categories, there’s no reason to tuck them away when they can be both functional and decorative. You can display rolled towels in a wine holder—it’s focally interesting and keeps closet space free for not-as-pretty linens. Or for a shared bathroom or beachy vibe, hanging up hooks might be the way to go. In fact, you can use reclaimed pallet wood to make a DIY towel rack. 6. TAKE BACK THE TOWEL RACK. Once you’ve moved onto rolled towels or hooks, there’s greatness in store for your old towel bars. Using old towel bars, you can add tons of extra storage in your bathroom all for the price of some baskets and a few zip ties! Particularly for renters with roommates or other shared bathroom situations, baskets like these can be lifesavers. Keeping toiletries separate and counter space clear is a game-changer (and no more messing up the medicine cabinet looking for your stuff). Utilizing that dead wall space above the toilet or near a mirror is a decorative bonus. Plus, if you’re not at liberty to make lasting changes to your bathroom, uninstalling these bad boys at move-out time is as simple as a quick snip! Bobby pins can be impossible to keep track of, which leads to plenty of piles on a countertop or rogue pins underfoot, but all it takes is a self-adhesive magnet strip to keep them in check! Keeping bobby pins inside a cabinet (as well as tweezers, nail clippers, and other easily lost items) is a supremely popular trick. These strips can be put on the inside of a drawer for easy access, too, or wrapped in thin fabric to make them pretty enough to display alone! 8. SPICE (RACK) IT UP. If bloggers have anything to say about it, spice racks aren’t just for the kitchen! These slender shelves are ideal for holding everything from toiletry samples to nail polishes and the innards of a medicine cabinet, and they’re a great way to utilize wall space that might otherwise stay bare and boring. 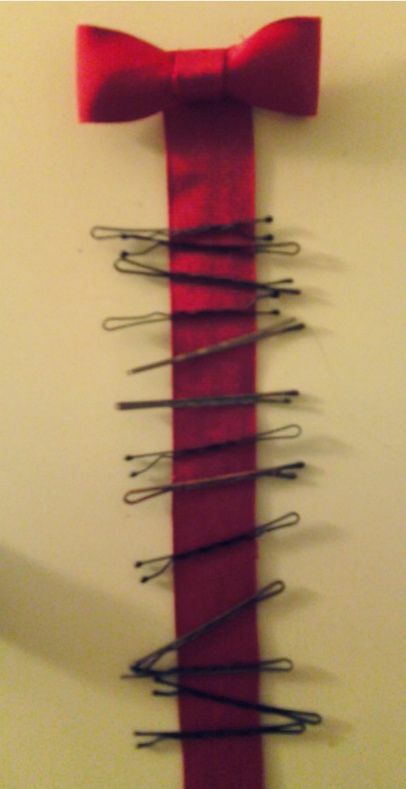 You can create a DIY salon rack snazzy enough to hold hairsprays, products, and makeup. You can also create a DIY nail polish rack to clear up those crowded cabinet drawers! 9. DIY TOILET PAPER HOLDER. Hiding toilet paper in an under-the-sink cabinet isn’t always best. Guests may not know where to find additional rolls, they could get obscured by cleaning supplies, or they could just be tough to reach. No matter the case, there are a lot of clever DIY solutions for keeping a toilet paper roll nearby! If you’re not scared of a sewing machine, you can make a cute fabric toilet paper holder. For non-sewing types, it couldn’t be easier to create a whimsical toilet paper holder—all you need is a long-necked dinosaur toy from the craft store, and a spray paint of your choosing! 10. DIY HEAT TOOLS HOLSTER. For people who use a lot of tools, a bathroom can quickly become a mess of cords. Hot plates and odd shapes can make it tough to find a drawer for styling tools like blow dryers and flatirons, and leaving them unattended can cause unsightly burns on carpet or tile. A DIY styling tool organizer gives every hair tool a home and is bound to clear up drawers and counter space. Not interested in making your own? A cute magazine holder (like #8 on this list) can serve a similar purpose. What are some of your DIY bathroom hacks? Let us know in the comments! Molly Hammond is a member of the content team at Storage.com. An equal opportunity storage enthusiast, Molly writes about everything, from where to store your extra boat to turning your storage unit into a custom cosplay workshop. When she’s not learning about the evils of plastic bags for clothing storage, she’s eating french fries, watching HBO, and wishing for snow. Storage.com is an advocate of a cleaner home, whether through helpful tips for tackling clutter or the use of a storage unit. Whether you’re in a three-bedroom home or a studio apartment, chances are you have clutter. Spare rooms often become dumping grounds for unused items. Countertops become havens for receipts, magazines, mail, and other items that should be filed away. And, of course, there’s that hallway closet that’s filled to the brim—the one you’re too scared to open after you were barely able to get it shut the last time. While getting rid of trash is easy when decluttering, it’s much harder to get rid of items that you don’t need around the house every day but still want to keep. Think old family photos, financial documents, Christmas decorations, and the bike you ride to and from work when the weather allows. Rather than stressing about ditching these belongings or finding a larger home, you can rent a self storage unit. Renting a storage unit is a great solution for keeping all of your belongings while getting the most use out of your square footage. But before you go running off to the nearest facility with a 10×10 available, follow these steps for using self storage to declutter your home. How do you determine what needs to go into self storage? That’s easy. Create an inventory of the non-essential items taking up space in your home. The best way to take inventory of these items is to separate them into four categories: records, keepsakes, seasonal, and junk. Records would be things like financial documents (taxes, investments, credit card statements, loans, etc.) and home or vehicle documents (mortgage files, insurance policies, appliance manuals, etc.). As for how long you should keep records, each document has its own “keep” period. For example: Taxes should be kept up to seven years whereas bank statements should only be kept for a year. Any record that’s past its recommended keep period should be shredded and/or thrown away. Keepsakes include more personal items, such as photo albums, family heirlooms, collectibles, antiques, and furniture that you may use later down the road. While you might not use these items every day (or even every month), they’re belongings you want to keep for sentimental or personal value. Seasonal items can include winter and summer clothing, holiday decorations, lawn equipment, boats and ATVs, and sporting gear. These are usually the possessions you keep in closets, garages, attics, or basements when they’re not in use. Junk is whatever you have left. This includes broken items, belongings you never use, things you don’t have a place for, and possessions that have no personal value. Either discard, sell, or donate these items. Once you’ve taken inventory of your clutter, it’s time to find a storage unit for the items you want to keep. This means finding the best storage facility, unit size, and storage features for your needs. If the items you’re storing are things you’ll need on a regular basis, such as a bike, then it may be best to find a storage facility near your home. However, if you’re only storing Christmas lights and the inflatable Santa collection you use from November to January, the location of your storage facility isn’t as important since you won’t need to pick up and drop off these items frequently. Each facility has different storage amenities available, which is why it’s important to determine what items you’re storing before finding a facility. For instance, if you plan to store wooden furniture, which can crack in extremely cold environments and warp in hot, humid environments, you’ll want a storage facility that has climate-controlled storage units. If you’re storing expensive or personal items, such as jewelry, wine collections, or family heirlooms, you’ll want a storage facility with good security. As far as storage unit size goes, a 5×5 or 5×10 is what most people use to declutter their homes. These units are roughly the size of a walk-in closet and can hold a mattress set, small furniture, and a few boxes. If you need to store multiple large items—like a sofa and armchair, bed frames, and some boxes—a 10×10 would be better. This unit size can typically hold the contents of two full bedrooms. If you plan to store a recreational vehicle that you only use when the weather’s nice, such as a motorcycle, ATV, or boat, ask the facility about vehicle storage options. Some facilities will have indoor spaces from sizes 10×15 and up; others will have outdoor or covered parking stalls. After you’ve found your unit, it’s simple. You just move in! Though, one thing many self storage users don’t consider is whether they need to visit their storage unit after moving everything in. This is especially true of people who don’t need to frequently swing by the facility and grab items. Nevertheless, it’s important to regularly check in on your storage unit to make sure your belongings are still in good condition. A good guideline would be every two to three months. SEARCH FOR A SELF STORAGE UNIT NEAR YOU!